On March 6th, Generation NEXT Franchise Brands announced, ‘that it has launched Generation NEXT Vending Robots Inc., an internal subsidiary whose purpose will be the creation, development and manufacturing of new robotic vending concepts that will utilize the many features from recently acquired design and utility patents. Americans are obtaining snacks from a number of places ranging from traditional grocery stores to online subscription services and even their workplace. Food retail is the source for 81% of snacking occasions, down 4 percentage points from 2012, according to Hartman Group. Meanwhile, 11% of snacking occasions are sourced from foodservice, up 4 percentage point vs. 2012. Foodservice is also a growing source of immediate consumption snacks. This type of snacking is defined by Hartman as an eating occasion in which at least some items for that occasion were purchased within an hour of consumption. Eighteen percent of snacks are considered immediate consumption, up 5 percentage points since 2012. Thirty two percent of immediate consumption snacks are sourced from foodservice, up 11 percentage points since 2012. Another growing source of immediate consumption snacks is the workplace, up 10 percentage points to 16% vs. five years ago. This would include food sourced from a work cafeteria or catering that’s been brought into the workplace. Supermarkets can grow their snack share by offering solutions that align with snacking drivers. “The future of snacking demands that companies think about development from a needs-based perspective. Orient your offerings to at least one of the fundamental drivers of nourishment, optimization or pleasure. A clear point of differentiation that aligns to one of the three will be critical for really providing a value proposition that connects with consumers,” said Barnett. Snack marketers should also consider freshness, since it signals quality, and think about whether their snack package design jibes with how a snack will be consumed. Can it enable a mobile lifestyle, for instance, asked Barnett. She urges food retailers in particular to optimize store layouts and product assortments in a way that services and even inspires snacking occasions. Supermarkets must also strike a balance between products that reflect freshness and quality with more indulgent, processed snacks that are marketed by iconic brands. “Millennials in particular use snacking to ensure sustained energy to get through the day,” says a Hartman Group researcher. 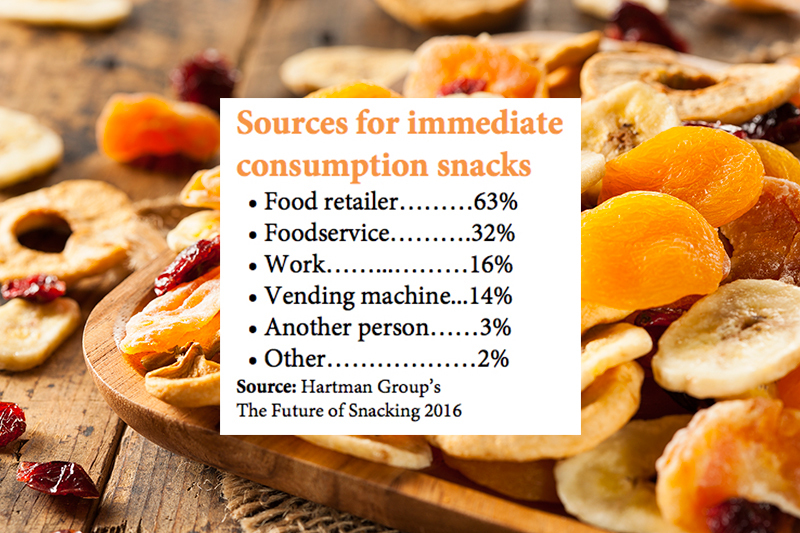 Of the vast majority of Americans (91%) who snack multiple times per day, 8% forgo meals altogether in favor of snacking, finds Hartman Group’s Future of Snacking 2016 report. “How we go about planning, acquiring and consuming food has been disrupted, and the result has been the displacement of meals and variations in when, how and what gets consumed,” said Tamara Barnett, VP of strategic insights for Bellevue, Wash.-based Hartman Group, during a webinar presentation of the findings. Hartman Group outlines three main drivers of snacking occasions, which tend to overlap. They are snacking for nourishment to help meet daily sustenance (56% of all snacking); snacking for optimization to help fulfill mental and physical performance (34%); and snacking for pleasure or to fulfill emotional desires for enjoyment, craving and comfort (49%). If studies have shown, happy retail employees ultimately make for happier bottom lines, then a new study is a hopeful sign for big retailers that their results will be under less pressure in the future. A UBS Evidence Lab study of more than 150,000 employee satisfaction reviews from job review site Glassdoor found that overall satisfaction levels at Walmart, Target and other big retailers reached new highs. In fact, among the hardlines retailers in the UBS study, Walmart scored the biggest gain in employee satisfaction with their compensation. A key to employee satisfaction, of course, is compensation. A variety of retailers, Walmart and Target among them, have lifted wages over the past two years.